Some supposedly “American” innovations in democracy actually began in Australia, led by Tasmania. 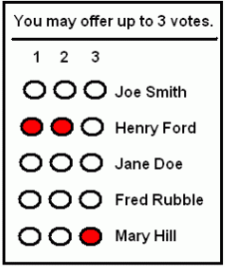 Perhaps the most surprising of them might be the official and anonymous ballot–first used there in 1856–inaccurately called the “secret ballot.” After experiments in Louisville, KY, and other cities, in 1888 Massachusetts became the first U.S. state to require government printed, anonymous ballots based on the Australian model. Washington and Lincoln had been elected using open, privately printed ballots, as was New York City’s infamous Tweed gang. A more rarely used Australian innovation aims at fair representation, intended to make it more feasible for minorities of all sorts to become officeholders. Tasmania has used one such approach since 1907: ranked voting. Candidates are ranked on ballots, and votes are distributed according to the rankings. In Massachusetts, the City of Cambridge adopted a version of this approach, starting in 1941, and still uses it. Ranked and weighted voting: Tallying elections using ranked voting is always complex, and it always involves some arbitrary shortcuts for distributing votes according to rankings. No state has adopted it. Cambridge used to need about a week for a tally until 2001, when the city bought a computerized system–also adopted by Burlington, VT. Australia continues with slow, manual tallies. A week after its 2016 elections for parliament, the winning party was known, but the numbers of members for the parties remained in doubt. It has been shown that unbiased translation from voter rankings to candidate selections poses a factorially complex problem, far beyond foreseeable computing power for voting populations of most communities. Weighted voting provides a far less complex approach to fair representation, in which voters weight rather than rank their support for candidates. Modern forms of it are innovations from the United States, not Australia. The simplest fair-voting plan equips each voter with multiple votes to be allocated among the candidates for an office. Such an approach can be compatible with electronic, scanned and plain-paper ballots and can yield an almost instant election result. Adding normalized weights that were assigned to candidates by voters avoids the arbitrariness and huge complexity of trying to interpret rankings. Weighted or “cumulative” voting is used in business settings, but no U.S. states and only a few communities–such as Port Chester, NY–have adopted it. However, the Electoral College that chooses Presidents has provided a longstanding example, since 1824. Official cliques and transformative change: Local governments in most communities often fall into control of official cliques, but those may wax and wane over time as powerbrokers come and go. Election reforms can help communities resist cliques, increase diversity and improve open government. One can expect resistance to such reforms from members of cliques. New England towns with representative town meetings typically have annual elections for groups of officeholders who hold staggered terms, with only a subset of a group elected at a time. Such a custom promotes formation and persistence of official cliques; they need focus on only a small number of candidates in any one year. It harbors minefields for independent candidates and newcomers. A potentially transformative change to a New England town would truncate current terms of offices and change to elections every few years, with all members of groups of officeholders elected at the same time, as typically occurs in cities. Coupled with change to weighted or “cumulative” voting, minorities of many sorts would see improved opportunities to counter cliques and to elect some officeholders. This entry was posted in Elections, History, Regulations on July 10, 2016 by Craig Bolon.